A while ago, my husband had to do a late night/overnight techy thing at work. I immediately decided that I should make some treats for him to share with the other guys who would be there with him. When I found out that one of them is a vegan, I headed right to Michele’s blog to look for vegan treats. 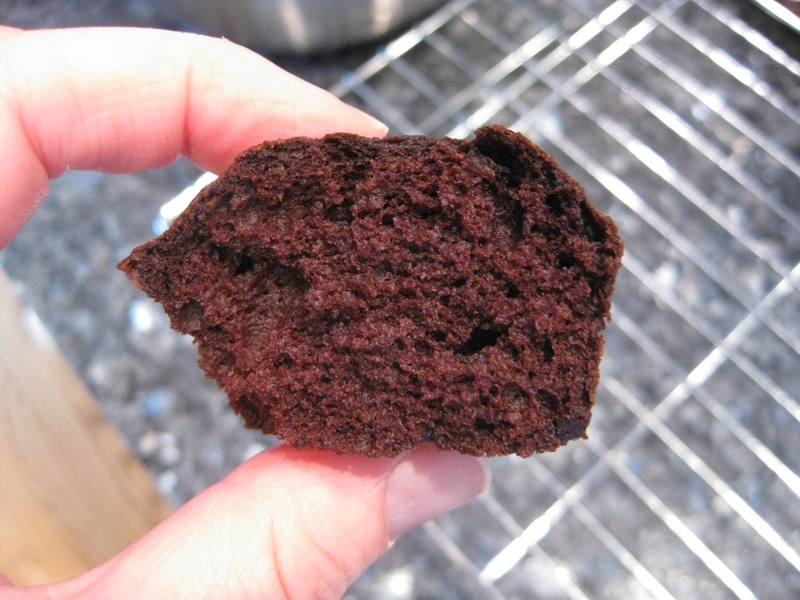 When I saw this recipe for Vegan Low-Fat Chocolate Cake, I knew it was the one I wanted to try. The recipe is from the Flour cookbook, which I keep hearing about, and now that I’ve tried this recipe, I’m ready to buy the book. They baked up beautifully, although please ignore that goofy crumb on top of the cupcake in the front. They were tender and moist, and if you didn’t know they were vegan, well, I don’t think you’d know they were vegan. Please note that I am holding a mini cupcake…my hands are not that giant. 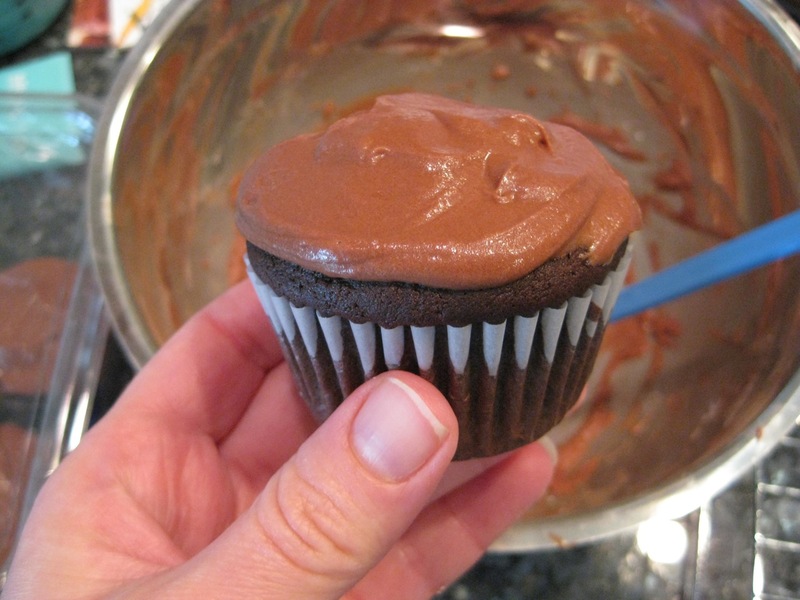 I also found a vegan frosting recipe right here on Michele’s blog. (The frosting recipe is in a post with yet another vegan chocolate cake, but that’s not the cake that I made.) The frosting was full of chocolate flavor and was sweet, and tasty, although I will admit that it didn’t quite compare to a buttery frosting. I will absolutely make this cake again, and I won’t wait for a vegan occasion, or even a low-fat occasion – it’s great for any audience! I’ve got the Flour cookbook too. Kinda hard to read (visually, the print is too light) but full of good information. I rather like the cupcake with a crumb–I have days like that sometimes. Just when I think everything is good, something pops up I wasn’t expecting. I’ll be honest, I’ve never made any vegan baked goods before. But the recipe looks dead simple–there aren’t even any weird ingredients. Cool. Thanks for the sharing! 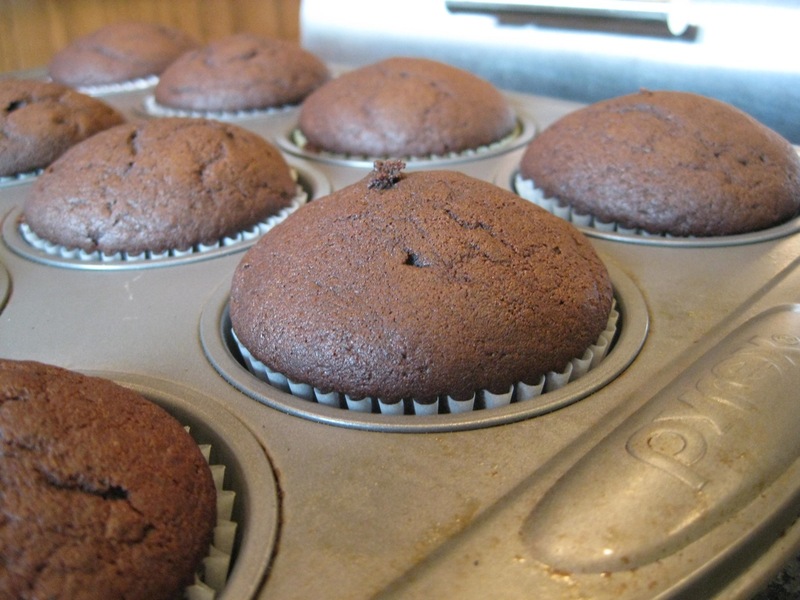 These cupcakes look great, and It’s a good idea to have a vegan recipe, just in case. I’ve been dying to try something from the Flour cookbook! I’ve never made vegan anything-these cupcakes look fabulous! Interesting! I just made my first vegan cupcakes and really enjoyed them, and I’d like to compare the two because they’re quite different. They went to work with my husband, too, and he didn’t tell his coworkers they were vegan. No one noticed. I am SO glad that you enjoyed these. They look perfect! You had me cracking when you pointed out that the cupcakes were minis and that you don’t have a giant hand! This is off topic, but I didn’t see anywhere else to post. I like your vertical garden pictures. What are you using to keep the dirt/plants in? I am assuming landscape fabric or something like that? Those pictures were taken at the Chicago Botanic Garden. Sorry I can’t help you with any vertical gardening advice!